Not just wedding day tiaras! I just want to share a secret with you! As I am writing this, I am wearing a diadem. Owning and wearing tiaras makes me happy, and pours creativity into my soul. I own over one hundred tiaras and diadems. Some are my own hand-made tiaras that I have created and some are antique, Napoleonic, Victorian and Edwardian styles. I have been making and creating hair adornments including tiaras for three decades. In my shop, we have over three hundred tiara samples of my work to cater to the tastes and preferences of everyone, including brides, Elton John party guests, and even for use in special projects. I also do commissions for religious statutes, dolls, real-life swans, and just for people who have a love of hand-made tiaras and enjoy wearing them to celebrate life! 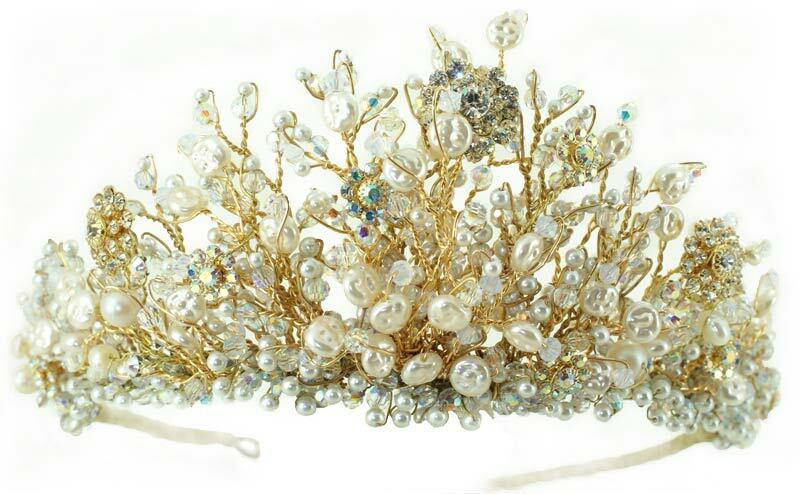 For your wedding day tiara, handmade in England, there can be no finer designs to make you look absolutely beautiful on your special day than those made exclusively by Basia Zarzycka. For over thirty years, Basia Zarzycka has been creating some of the most sought after bridal gowns and wedding day accessories in the country. Many people consider her creations to be the crowning glory of their outfit, a beautiful hand-made wedding tiara they can be proud of. Using gold and silver wire, fine crystals, and pearls, Basia creates her miniature masterpieces by hand. In addition to the range of styles that she makes to sell through her London shop in Sloane Square in Chelsea, she also has a selection now available online. Swarovski Crystals, cultured pearls and jewels are cleverly incorporated onto gold and silver wires to produce some of the most gorgeous designs that any girl would want on her wedding day. The crowning glory of her outfit, that sets the scene for everything else and beautifully frames the face can only be a tiara or similarly exquisite hair adornment from Basia Zarzycka.